Quite often, we don’t realise that the things that we stumble across in life can be fodder for gauging our spiritual lives in ways that surprise us. Just last week, this thought came to me as I casually glanced at a news article which I would least think that can do this for me, or for anyone else. It was the unlikely news story of a beauty pageant. On the surface, it may seem awfully trivial and perhaps even mundane, but an insight was revealed to me that there is something rather hidden, yet very important that we can learn from it. 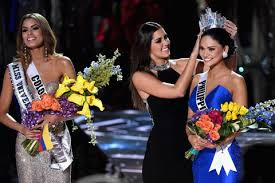 In the finals of the recent Miss Universe beauty pageant, a contestant which was not the winner was crowned and named by mistake, and the poor embarrassed host who committed this gaffe had to immediately correct this error of universal proportions by apologizing to the runner up, getting her newly placed tiara removed from her head, and crowning the rightful winner of the contest – in front of a worldwide audience. This unthinkable mistake naturally upbraided the true runner-up (Miss Colombia) together with all her countrymen and women. A wrong winner was crowned, and the real winner was by-passed, at least for a few moments. Why would I even want to mention this seemingly inane incident in a blog that serves a spiritual purpose? Because I see such irony in it. So much of our life’s problems come from getting it wrong when it comes to crowning what we think is most important in life, doesn’t it? In so many spiritual counseling and confessions that I have heard, it is apparent that it is when we make our worlds orbit around the wrong centres that unhappiness and frustrations abound. Our relentless search for wealth, happiness, popularity, freedom from illness and suffering and success have so often been made the locus and aim of our search for happiness and stability. But the harsh truth is that the moment we think we have attained our goal, the opposite happens - we become even more unstable, more insecure and more greedy. Like the poor host at the pageant, we have too often crowned the wrong winner in life. When Jesus revealed that he is the way, the truth and the life, he was revealing that as long as we do not put him where we should be orbiting around him, that our lives will be unsettled and there would be no peace. We may know that he said this, but we have not really taken it with much seriousness. But the truth is that in so most of our lives, these mis-crownings (pun well intended) are very prevalent. When these things happen in our lives, God could rightfully smite us immediately as we have contravened his very first commandment, which is to love God with all our heart, soul and mind. When such a transgression has been made, such opprobrium deserves drastic measures and God would be entitled to set things right. But that is human logic, which is hardly ever applied together with love - love as God loves. Much to the credit of the real winner of that pageant, Miss Philippines did not grab the tiara off the head of the wrong winner and place it on her own head. She waited for her rightful crown and her rightful crowning. Gracious as she was, there was one who was far greater in history who paved the way for graciousness to be seen and experienced. When Jesus died on the Cross of Calvary for humanity's salvation, he did this but on a cosmic level. Our sin of having so many other idols in our lives, to which we pay far more attention to than we should, must offend God immensely. Much as he knows he is the truth, he doesn’t forcibly edge out all the false idols in our lives. Much as he is life itself, he doesn’t smite with anger all those other goals in our lives that often bring death. Instead, he takes it all in - quite literally. He takes upon himself the sins of the world out of love for us. And he lets the effects of his sacrifice take a long, slow process to work its truth into our hearts. Grace takes its time, and conversion is also a slow process that respects the metanoia of the heart. I suppose this is the law of gradualness at work. Shame doesn’t help to tenderize hearts nor does it speed up the process. This is why perhaps confession and regular visits to the confessor does something so imperceptible – it releases slow doses of grace that makes us see the light of our folly where we have crowned the wrong centres of our lives. The many false kings in our lives may be crowned with gems and jewels, lots of our attention, time and resources. They tire and wear us out. But we will be so graced to realise that the real king wore for us on his head the crown of thorns. Knowing this should help us to be sure about who the real king is, and dethrone the false ones, enabling us to live rightly ordered lives. I like what you said about the law of gradualness......... “where grace takes time, conversion is also a slow process that respects the metanoia of the heart.” These words came to mind when we had our usual RCIA sharing session. It was an interesting session on - Social Teachings of the Catholic Church - an eye-opener to some of our catechumens for it was the first time they were made aware of the Church’s concern and involvement in the nitty-gritty of whatever is happening in the secular world – in areas of social justice and especially the Church’s preferential love for the poor and marginalised. And this translates down to the responsibility of every baptised Christian’s as well. It led to quite an animated sharing in the group. On reflection, I felt that – that was our real poverty, that we could not do more! Perhaps then, it is in true humility that we fully face our insufficiency and turn and cling to the One whose grace is enough for all.